Pinotage, South African (18lb) Experience making wine from South Africa's signature grape varietal. This item cannot be ordered online. The Pinotage Grape was created in 1925 and is a cross between two vinifera grapes, Pinot Noir and Cinsault. Abaraham Izak Perold created the grape to bring out the brilliant robust flavors that both Pinot Noir and Cinsault possessed, while making the grape easy to grow. Now Pinotage is known to produce smoky, earthy flavors with hints of tropical fruits. Pinotage sourced from the Breede River Valley produce wines that express notes of cedar, plums, and dark berry notes. The wine then rounds out with a smooth, tannic structure. Enjoy these wines with a hearty stew or red meat. Please note that if you punch through too vigorously during fermentation you can get an almost burned plastic characteristic. It is better to ferment Pinotage at lower temperatures. The Breede River Valley is part of the Western Cape in South Africa. It is positioned at a low altitude and the region consists, of a hot but dry climate. It is the largest wine producing region in the Western Cape. The Breede River Valley offers gorgeous scenery of wildlife, mineral hot springs, and views from the cliffs of Du Toit Kloof Mountains. Pinotage is the Cape's signature grape. The Pinotage Grape was created in 1925. It is a cross between two vinifera grapes, Pinot Noir and Cinsault. Abaraham Izak Perold created the grape to bring out the brilliant robust flavors that both Pinot Noir and Cinsault possessed, while making the grape easy to grow. WINE STYLE: Pinotage is known to produce smoky, earthy flavors with hints of tropical fruits. Pinotage sourced from the Breedde River Valley produce wines that consist of cedar, plums, and dark berry notes. The wine then rounds out with a smooth, tannic structure. Enjoy these wines with a hearty stew or red meat. The Breede River Valley is part of the Western Cape in South Africa. It is positioned at a low altitude and the region consists, of a hot but dry climate. It is the largest wine producing region in the Western Cape. The Breede River Valley offers a gorgeous scenery of wildlife, mineral hot springs, and views from the cliffs of Du Toit Kloof Mountains. Pinotage is the Cape's signature grape. The Pinotage Grape was created in 1925. It is a cross between two vinifera grapes, Pinot Noir and Cinsault. Abaraham Izak Perold created the grape to bring out the brilliant robust flavors that both Pinot Noir and Cinsault possessed, while making the grape easy to grow. Now Pinotage is known to produce smoky, earthy flavors with hints of tropical fruits. Pinotage sourced from the Breedde River Valley produce wines that consist of cedar, plums, and dark berry notes. The wine then rounds out with a smooth, tannic structure. Enjoy these wines with a hearty stew or red meat. Musto is looking forward to bringing you some of South Africa's finest wine grapes! We can't wait hear about and taste the magnificent wines you will create with these grapes! Pinotage is one of South Africa’s most famous wine varieties. It was created in 1925 by Stellenbosch Professor A. I. Peroldt. It is a cross between Pinot Noir and Cinsault (Hermitage) grape varieties. The vines themselves are easy to handle and have good size yields. 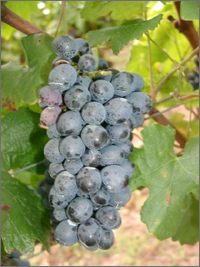 Characteristics*: Pinotage can be produced in many different styles. For example, it can be made through carbonic maceration and resemble a Beaujolais. Or it can be made in a California Zinfandel style, a light and fruity nose with rich and supple flavor. Aromas/Flavors*: Pinotage gives off a lot of rich fruity flavors. It is wine that can be manipulated to either a fruit forward wine or one with subtle light and fruity notes. Other aromas/flavors include smoky, bramble, and earthy flavors. Food Pairing: Goes very well with meats and poultry. Aging**: May age well depending upon winemaker style chosen.